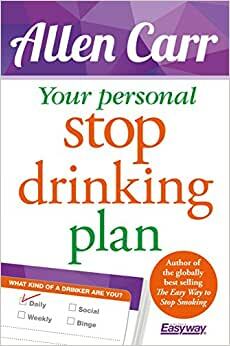 READ THIS BOOK AND BECOME A HAPPY NONDRINKER. Allen Carr's Easyway method has helped millions of people to stop smoking and it has now been applied to other addictions. This is an interactive Allen Carr book. By regularly interacting with the text in an easy yet dynamic and measurable way, you begin to write the story of how you came to drink. By understanding why you continue to drink in spite of the obvious disadvantages, you are able to follow the simple step-by-step instructions that set you free. No pain. No drama. "The Allen Carr program was nothing short of a miracle." "It was such a revelation that instantly I was freed from addiction." "His skill is in removing the psychological dependence." Allen Carr was a chain-smoker for over 30 years. After repeated failed attempts to stop smoking, he went from 100 cigarettes a day to zero without suffering withdrawal pangs, without using willpower, and without putting on weight. The phenomenon that is Allen Carr's Easyway method was born, and it led to his recognition as the world's leading expert on stopping smoking.